National Gibson Model 1155 (J-45) circa 1949 | SOLD | Post WWII, Gibson was owned by CMI, which also controlled the distribution rights to National Valco instruments. At this time, Gibson began to make guitar bodies that would eventually be joined with a National-branded neck. This guitar is part of that historic lineage. 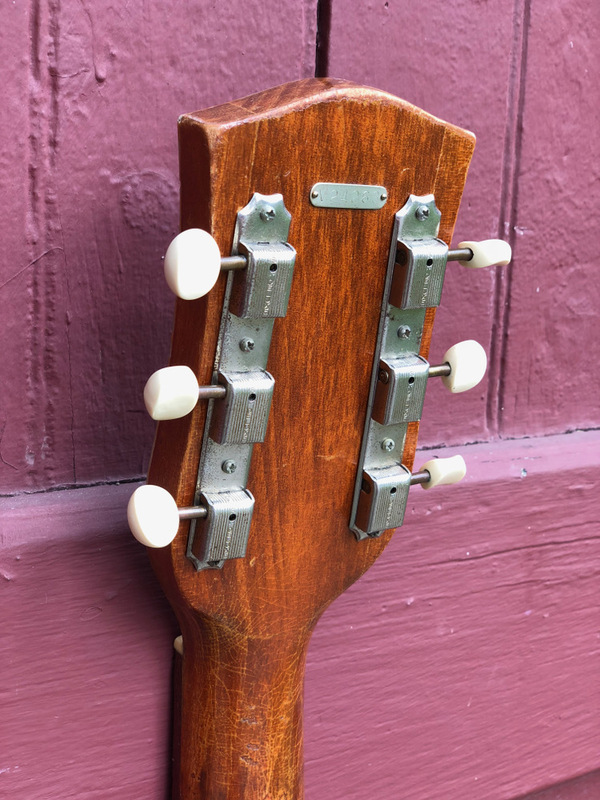 The small metal tag on the back of the headstock is impressed V 24263, which, according to the progression of Valco serial numbers, dates this guitar to circa 1949, so essentially a late 40s Gibson J-45, with some differences: a different bridge shape, no truss rod, and a unique headstock and pick guard shape. The body measures 16 1/8" across, and is made from mahogany with a spruce top, whose sunburst is black and brown in tone rather than the typical Gibson burst of the period. Scale length is about 24 7/8". Fingerboard is Brazilian rosewood, as is the bridge, which has a drop-in saddle and reproduction pins. The neck is mahogany, with a comfortable and modern-feeling C-profile. 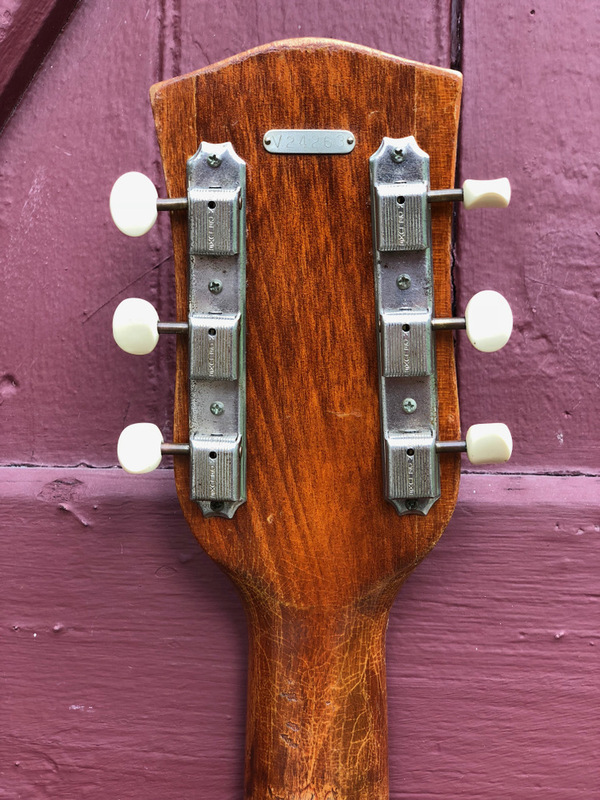 The braces are tall and thin, as seen on Gibson flattops of the period. 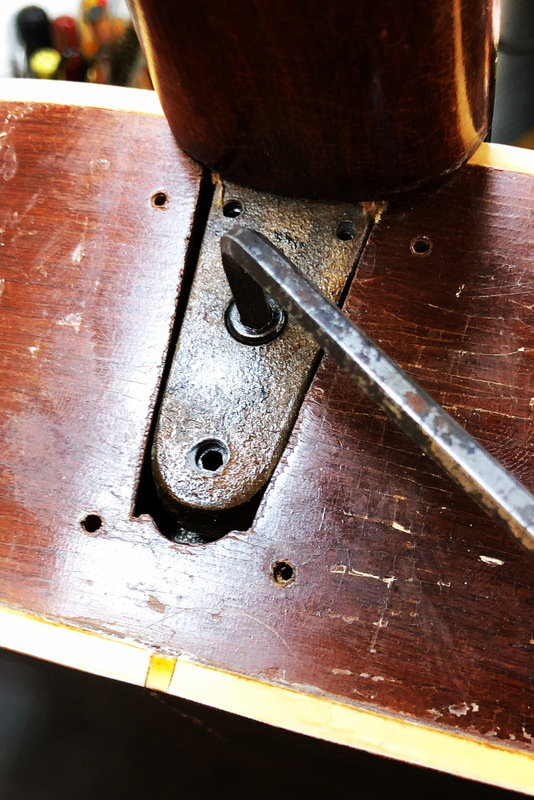 Repairs include: Because of many loose braces, the back was removed and all braces and blocks were re-glued; a number of thin side cracks were glued and cleated; several back and top cracks were glued; the neck was removed (bolt on) and the angle adjusted; frets were leveled and dressed. The guitar is very structurally sound. There is some minor finish flaking on the sides and a bit of capo wear on the back of the neck. The Kluson Deluxe tuners are of the period but not original to the guitar. With its tasty brown/black color scheme, comfortable neck profile and action set at 5/64" - 7/64”, this unique guitar is the total package; it plays smoothly, and produces an exceptionally clear and balanced tone, with sweet highs, ringing mids and a dry, thumpy bass. It ranks among the better sounding guitars we’ve offered, with or without picks. Perfect for the player who seeks 40s J-45 tone on a 60s J-45 budget.